This thread is a followup to the people contest thread. 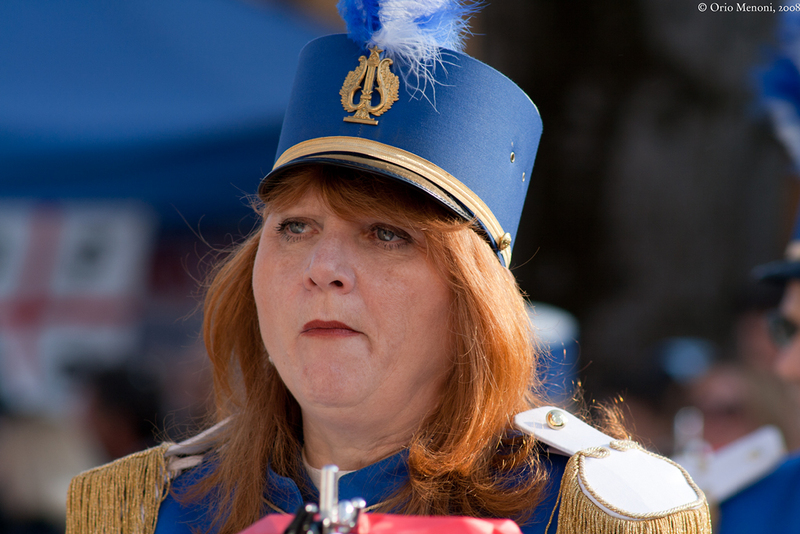 Laurence, here's a picture of another redhead-by-the-bottle that I took the same day as the majorette. Good image. The crop actually looks sharper than the full image on my screen. Just personal taste but I would probably have made it a square crop. I don't think that's from a bottle - it looks too natural. My niece has hair just that colour. My father in low was 60's and didn't have any white hair !!! First lens in my wish list. Okay, now I'm wishing my package would hurry up. It's been exactly 3 weeks, being sent through DHL International. Tracking doesn't show detail, only that it is "in transit". The image, Orio, is yet another testament to the OVERALL signature of the lens. It might not be the very top of the pack in sharpness, but I would NEVER be disappointed with the results I see here. And whether or not she has bottled hair color, or is quite as pretty as some young girl, we all know that looks mean nothing in comparison to a good mind. I am enamored with the COLOR gamut here! I suppose the combinations of lens, film, or sensor have come together to produce such vivid - but not overblown or oversaturated - colors? Which film or sensor have you used here, Orio? Again, look at the beautiful gradations and transitions between the two shades of blue in the upper left! Also, the red and white cross directly below. There is a resemblance to a painter using a very broad brush to blend edges. Also, the circular highlight - with just a hint of border around the circle - shows that the lens has tamed even this strong glimmer-highlight from the sun reflecting light from a metal instrument. It looks like the depth-of-field might be 6 inches or so? 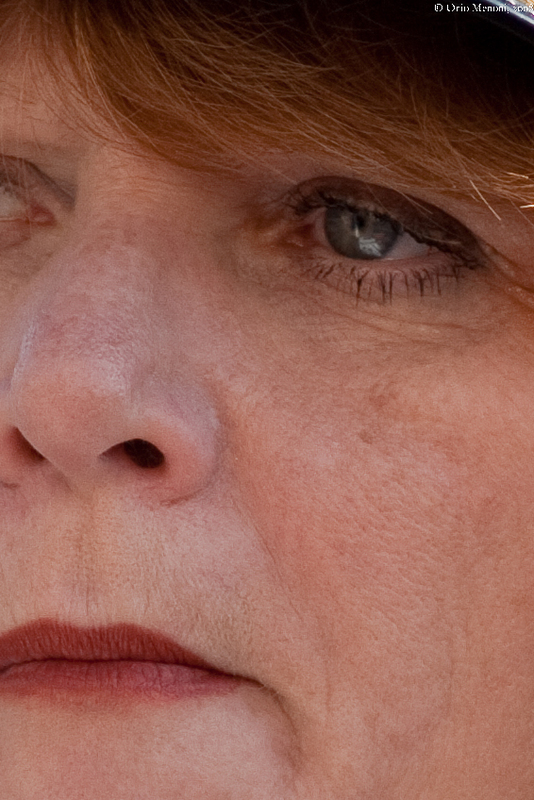 In any case, the front of her face, from the mouth to the nose and to the eyes, looks quite sharp. Yet, the fadeoff lends good dimension - such as the slight fadeoff of the feathery structures at the top of the hat. It is totally obvious that you know how to use this lens as a tool, Orio. In turn, that makes for a formidable combination of photographer, camera, and lens, providing a feast of color and form. Looking at these, I get inspired to try more portraiture photography. While I guess the Sonnar isn't at the very tip-top of the scale at any one thing, it is the overall excellence of all its factors that counts. I really can't wait to receive my Sonnar. I'm hoping it's a good quality-control lens. While I'm sure the modern lenses might be "better" than the old Olympia design, I sure can't fault the Sonnar's own signature. If there are any more from the Sonnar available, I would love to see them. I could look at these magnificent images all day. Oh...and I looked in the mirror this morning and found that my hair had gone almost all white overnight! Could you post a pic of the lens itself ? What's specific with Contax ? I have a Sonnar in P6 mount, "starwars" zebra version. About the lady "in red", she makes me think of Angela, the german first lady. Olivier, do you have any images from the Sonnar? Whether you might have some "good or bad" images in your opinion, it would still be good to see. It's very good and I like it very much. It's just my old workhorse, the 400D. It was the last Canon cameras before they introduced the new CMOS II processor. So it still has the colours of the 300D, 20D, 30D, and 5D first type. With the 40D and later cameras, the processor changed and the colours did, too. Newer Canon cameras have lots of great features but colour wise I still prefer the rendering of those older cameras. The Contax version (first batch released in 1976) is still Olympia-based but was redesigned by the then Zeiss engineers to be optimized with close focus correction, obtained by the use of a floating element. This redesign also allowed a shorter (compared to Contarex version) minimal focus distance of 1.4 m.
The optical design is based on a new calculation which guarantees excellent imaging performance and a remarkable image field illumination. The short and handy design makes this Sonnar type ideal for freehand shots. The distance between the exit pupil and the image plane is only about half the focal lenght, an essential prerequisite of good illumination of the finder image field with any Fresnel-type focusing screen. A further novelty is the automatic correction when setting the distance. The useful range was thus extended up to a short-range limit of 1.4 m., where an object field of only 145x220 mm fully covers the 35mm format. By the way, Zeiss' words and the specs confirm my impression that this lens gives the best in the short-mid range (portrait range). This one looks like if she could strangle a horse with her naked hands! Thank you Orio for explanations.